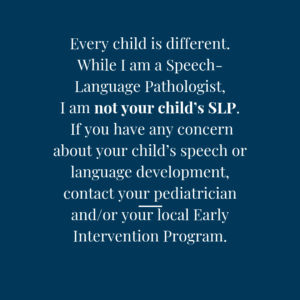 Laying the Foundation for Talking through Imitation | Speak. Play. Love. You might be hoping that your little one will start talking any day now. 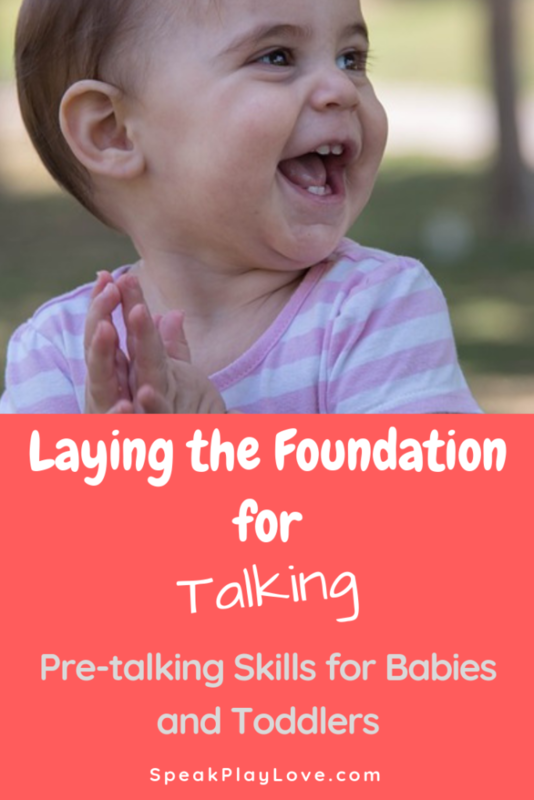 Or maybe your have an infant (6-12 months) and are looking for some ways to build that foundation for talking. 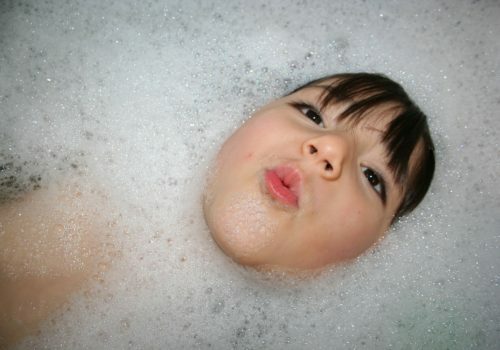 Here’s a question for you: Is your child imitating you – your actions, your expressions, your sounds? 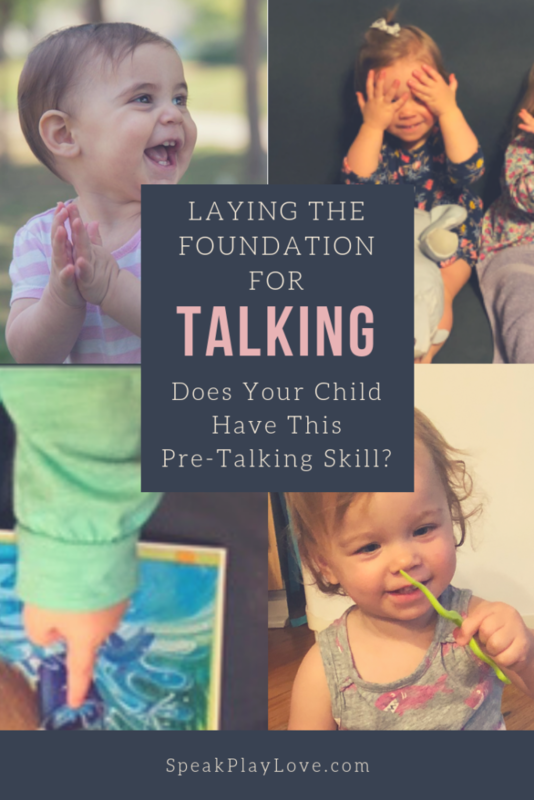 Think about how babies learn say their early words – they imitate you or repeat after you. That’s why learning the skill of imitation, any type of imitation, is so important as a foundation. It seems simple enough, but there is actually a lot going on when a child is learning how to imitate. Watch for your response – When it is a positive that will make him more likely to try to imitate more things! If your child is not talking yet, a great way to build the foundation for future talking is by working on imitation. You can work on this in some fun ways to help your child imitate actions and then work up to sounds and then words! Clapping babies are so cute! 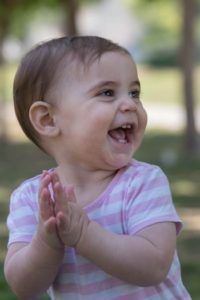 Clapping and raising both arms in the air are some of the earliest actions that babies learn to copy (and do on their own). Encourage your child to clap with you by demonstrating and even guiding their hands the first few times to help them understand what to do. 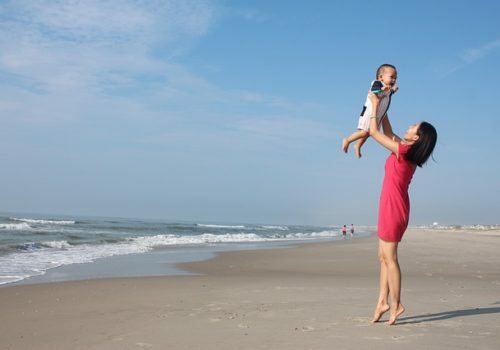 For practicing Arms Up, try creating a verbal routine (something you say the same way each time) by asking your child, “How big is baby (or child’s name)?” and then answering, “So big!” as you raise both hands into the air. 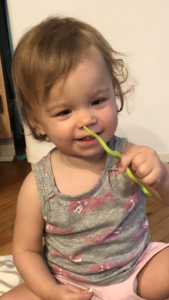 Once your child knows what to expect, you can ask the question and raise your hands up but then WAIT until she copies your action before you reward her by saying, “So Big!” This is sure to get lots of giggles! 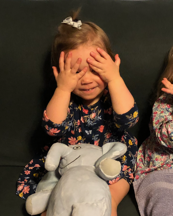 Peek-a-Boo is another classic for a reason. It’s very repetitive, which is perfect for very early learning. Plus, as babies learn about object permanence, having something (like your face) quickly “disappear” is exciting! You can try guiding your child’s hands a few times to help him get the idea. Pointing is great not only for imitating, but also as a foundation skill for early communication. Think about how much a child can express about what they want, need, or are interested in just by pointing! 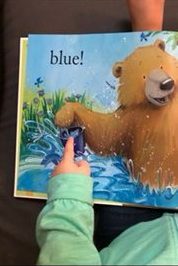 How to encourage pointing: As you are out on a walk or looking through a book, point to something that your child seems interested in. Then you can guide her finger to do the same. Reward her point by telling her what the item is called. You are also working on filling her bucket with vocabulary that she will use later! Try to read every day with your child to develop a routine that includes pointing to things in her favorite books. Remember, while you might be sick of reading Goodnight Moon, your child loves repetition! Plus, repetition is one of the best ways for her to learn. Once your little one is starting to imitate you a bit, introduce some simple sign language into the mix. You can teach this by modeling signs while saying the word, then guiding his hands to form the sign. Try to do this during meaningful times. For instance, if he getting milk, then show him the sign for milk, have him make the sign, and then hand over the sippy cup. You can look up videos of how to form individual words in sign language here – just type in the word you are looking for. Looking for another activity to incorporate sign language for pre-talkers? 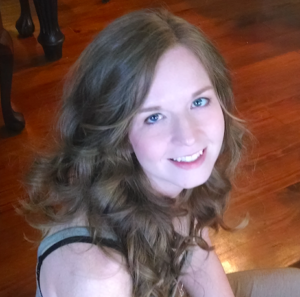 Check out this article on coloring or this one about pasta threading. Once you’ve got your little one imitating some basic physical movements, it’s time to try out some vocal imitation. Okay – I know we are supposed to be talking about getting your child to imitate you, but this is a good place to start. 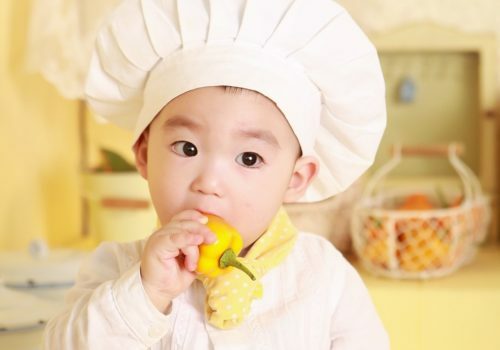 You will peak your child’s interest by imitating his babbling – or any sound he makes. This can also teach him that it is a type of game that can be fun! 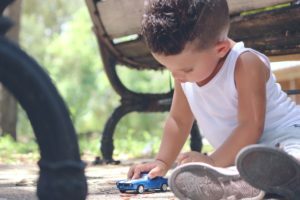 While playing with cars, try “Vrroom” or “beep beep.” Or while playing with a baby doll or stuffed animal, make crying sounds or drinking/eating sounds. This can be more enticing to some children to start making sounds with their mouths. Making animal sounds is another fun, silly thing to try with your little one! You can do this while looking at an animal book, at pictures of animals, or with animal toys. Some easier animal sounds are “woof,” “moo,” “baa” and “meow” but any sounds that are motivating for your child is a great place to start! And once you’ve got your child imitating vocal sounds, then next step are those first words you’ve been waiting for!! What is your favorite children’s song that has movements? 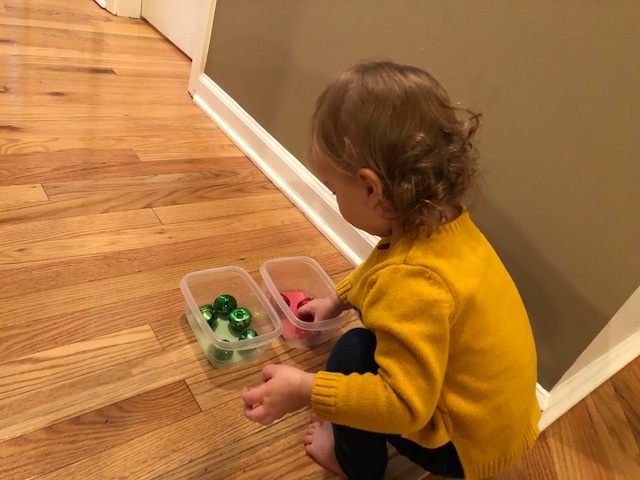 Sylvie’s favorites are “Wheels on the Bus” and “Let’s Go to the Zoo” (but we just sing it and do any movements we can think of) It’s also great to get the wiggles out! 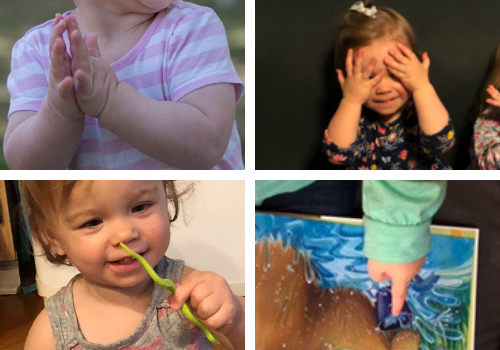 Do you use sign language or “baby signs” with your child?